These days many modern bathroom design ideas start with a Free Standing Tub Faucet. Freestanding Tub Filler Faucets represent an assertive design point of view and really make a statement. Gone are the days when sunk-in Jacuzzi tub would impress your neighbors. 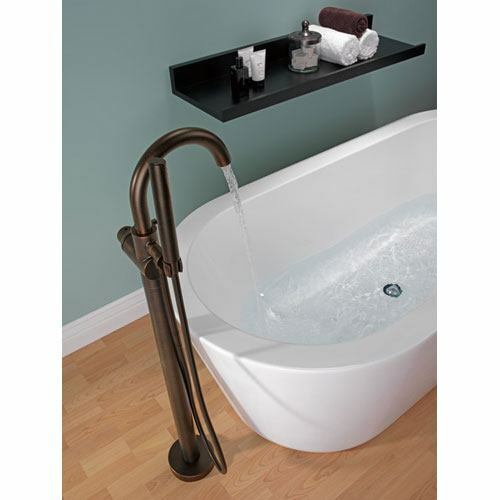 Now you need a Floor Mount Free Standing Tub Faucet paired with a traditional style clawfoot tub or a modern above ground soaking tub to make an impact. 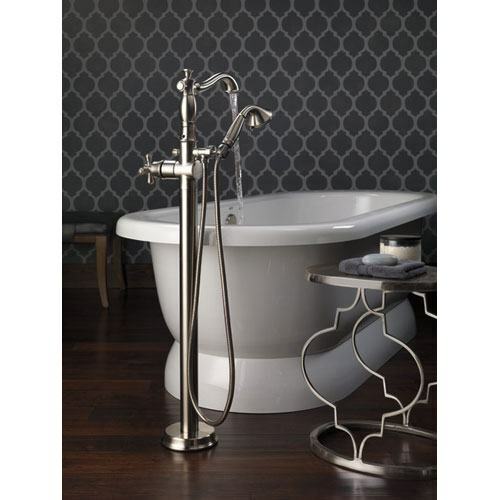 Stand Alone Bathtub Faucets are elegant and provide a functional designer flare to any bathroom. Oh, and by the way, they're not just for impressing the neighbors. You will personally get to enjoy using your stunning out-of-a-magazine bathroom design every day! Freestanding Tub Fillers break down into two major component groups. There's the part you see, called the Trim Kit, and the part that installs in the floor, called the Valve. 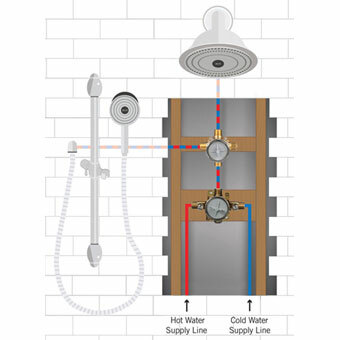 The Valve connects to your hot and cold water lines and sends water up into the Trim Kit where it is mixed to a warm temperature suitable for your bath. 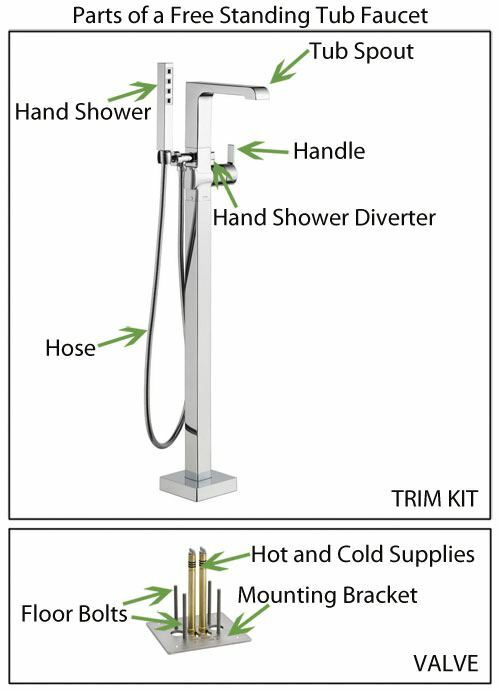 The image shows the breakdown of a Delta Freestanding Tub Faucet. Other brands might look and work a little different but this image provide a decent introduction to the various parts. You will basically find all the same components in every brand of Floor Mount Tub Filler. 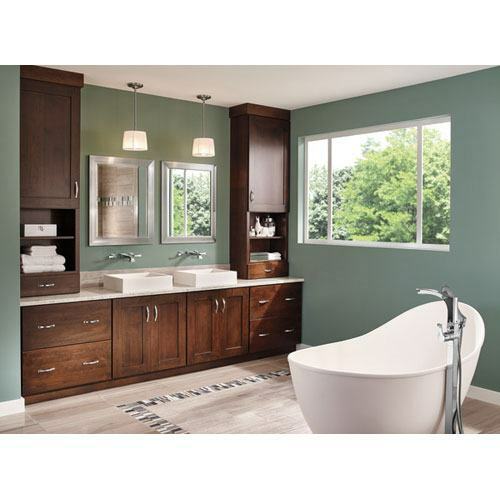 Trim Kit: The Trim Kit is the stylish, finished portion of the Free Standing Tub Faucet you can actually see. It is the part you interact with when using your tub filler. Tub Spout: This is where the water comes out when you turn the faucet on to fill your tub. Hand Shower: This is a handheld shower sprayer. Using the diverter you can switch the water flow from the Tub Spout to the Hand Shower. The hand spray is great for washing your hair, washing a dog, or washing a kid! Handle: The handle is used to turn the water on and off and to set the temperature. With Delta Free Standing Tub Fillers there is a pressure-balanced cartridge under the handle. Rotating the handle allows you to turn on the water and adjust it to the warmth level you desire. 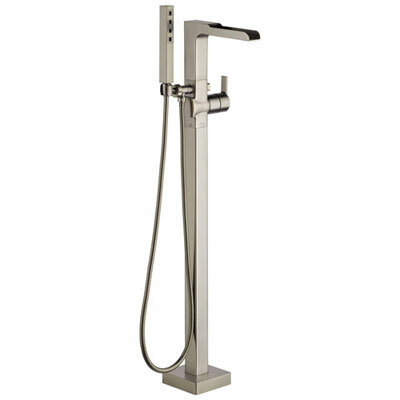 Hand Shower Diverter: Delta Free Standing Tub Faucets all include a hand shower. To switch the water flow from tub spout to hand spray, simply pull out on the hand shower diverter. To switch back, push the diverter button back in. When you turn off the water the diverter will automatically default back to the off position. Hose: The hose supplies the hand shower with water. Valve: The Valve is the part of the Free Standing Tub Faucet you do not see. It is the fixture that connects to your home's hot and cold water lines. In a Floor Mount Tub Filler the valve also includes the plate required to secure the Faucet to the floor. Hot and Cold Supplies: These tubes allow your hot and cold water lines to connect internally with the Freestanding Faucet Trim Kit. Mounting Bracket: The mounting bracket is used to secure your Freestanding Tub Faucet to the floor. It creates a sturdy and stable base so that after installation the Tub Filler will not wobble or move around. Floor Bolts: The Floor Bolts are threaded screws come up first through the valve mounting bracket and then through the base of the Trim Kit. Using a washer and nut you can securely attach the Trim Kit to the Mounting Bracket, locking it safely in place. These bolts will be fully covered by the base of the trim kit after installation is complete. There are some important things to consider when choosing the right Floor Mount Tub Filler for your bathroom. There are many different Freestanding Tub Fillers on the market to consider. When you begin your search for the best stand-alone tub faucet you will find that the prices of these fixtures are all over the place. Cheap no-name brand imported freestanding faucets start in the low hundreds of dollars and expensive designer brands cost multiple thousands each. How can you possibly decide? Since a Free Standing Bathtub Faucet is not something that is easy to change after it has been installed, take a bit of time to read this guide and learn about this really cool bathroom fixture. 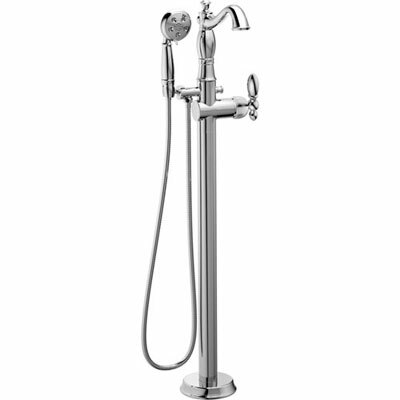 We have written this buying guide to Free Standing Tub Faucets to help you to get the maximum value for your hard earned money. We will help explain what factors to consider when choosing a Freestanding Tub Filler and point out some of the reasons for the vast price differences you will come across. To write this guide we scoured the internet for research, comments, and customer reviews on various different Free Standing Faucets. We merged this information with comments our own customer service has actually received from FaucetList.com customers to create a definitive buying guide to Freestanding Tub Faucets. We also have a section with a video on How to Install a Floor Mount Tub Faucet. This will help you to understand what steps must be taken to ensure that the installation of your Freestanding Tub Faucet goes smoothly and that end result is secure, sturdy, and stable. With Freestanding Tub Faucets quality matters. The last thing you want in your beautiful new bathroom is a wobbly faucet! Not only will make using the Tub Filler less enjoyable, but it can also be downright dangerous. A playful dog could knock it down and crimp your plumbing connections. Or worse, it could cause a leak and flood the house. As unlikely as these situations may be, they could happen. You really want to make sure your Floor Mounted Bathtub Faucet is installed safe and secure. The installation video below will help illustrate what takes to do this right. 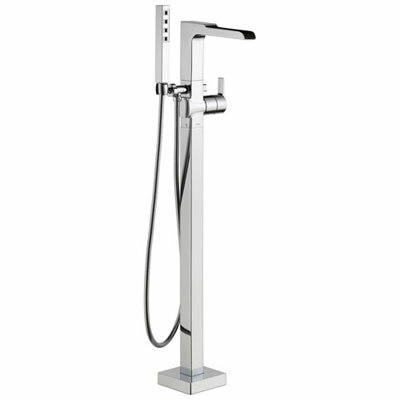 Having a nice quality sturdy Contemporary Freestanding Tub Filler is not just about safety. It's also about the simple day to day experience you will have while using the Faucet. You bought an inexpensive Freestanding Tub Faucet against your better instincts. After some installation trouble and a few extra hours of work the plumber reports that faucet is ready to use. It looks fantastic. I guess it was a savvy move to save a few bucks! You turn the handle and the water starts flowing. But it's not coming out very fast. No problem, you can wait a bit. By the time the tub is full the water has already started to cool a bit - but never mind, it's still ok. So you get it in and now you're relaxed, soaking in your large nice tub. You go to grab the hand shower to rinse your hair and the Tub Faucet sways alarmingly. You gingerly remove the hand spray trying not to pull too hard while you lift it up to your head. Tugging too hard will cause the faucet to rattle against the tiles. It might even briefly sway to a not-quite-perpendicular to the floor position. If this makes you a little anxious you are not alone. It's certainly not the relaxing experience you hoped for when you imagined using your new bathroom. Compare scenario one with scenario two in which you spend a little more upfront to get a solid and sturdy Free Standing Tub Filler. Your plumber arrives and is familiar with the installation procedure. It's a standard installation and he's done several like it before. After an easy install you're ready to test it out. Using the single handle you effortlessly set the optimal water temperature. The high flow rate allows your Modern Freestanding Tub Faucet to rapidly fill your large tub. When you hop in a few moments later the water is still steaming. You pull out the the hand spray and the faucet holds steady. You stretch the hose to wash shampoo out of your hair and the faucet holds solid. Now for a long relaxing soak. As you get out of the tub you even grab the Freestanding Tub Faucet for a little extra stability while stepping out. Now it really feels like the hard work and perseverance it took to get this bathroom remodel completed was worth it. Having a heavy duty, solid, and sturdy Floor Mount Tub Faucet is everything you hoped for and more! Scenario 2 is the clear winner! I know, I know, we all know you get what you pay for. However, in the case of a Freestanding Tub Filler they can just get so expensive. People often initially underestimate the cost of a Freestanding Tub Faucet and it can be hard to squeeze it into the budget later. Many comments online expressed surprise at just how expensive this particular fixture can be. Some of the cost is due to the difficulties with manufacturing an item like this. These are solid heavy fixtures that use a lot of raw material. 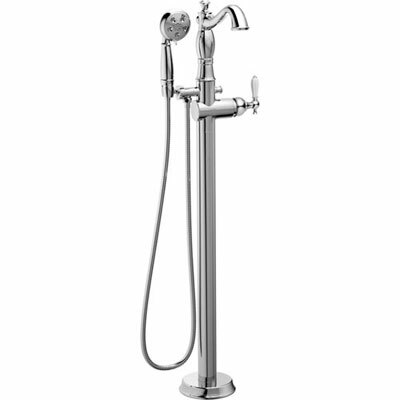 Some of it has to do with the fact that Free Standing Tub Faucets really are designer items. And designer brands can be very pricey. As nice as it would be to have the safe and sturdy unit, is it just too expensive? I mean have you seen these prices?? $2000, $3000, $4000... and often there are required parts like valves and handles sold separately. On the other hand, do a quick google search and you will find very similar looking fixtures in the $200, $150, and even $89 range. How can this be? The modern designer Floor Mount Tub Faucet styles have been knocked off relentlessly and it's especially hard for consumers to tell the difference from just a picture online. Of course we all know that imported products are less expensive. But how can it be that a nearly identical looking fixture sells as high as $4000 or low as $89. There has to be an explanation for a price difference of this magnitude. This buying guide will explain some of the differences between lower end and higher end Freestanding Tub Faucets. It is our belief that you don't need to spend $4000 for something good. We do however strongly recommend you really take some time and consider whether or not going for a super low end import will cost you more money in the long run. 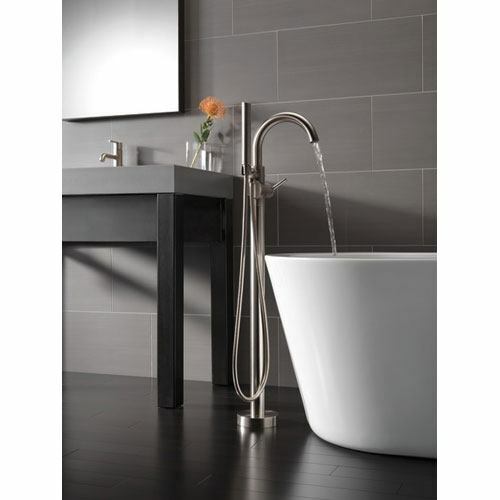 Here are a few examples of high-quality Floor Mounted Tub Faucets that won't break the bank. Consider for a moment the famous Captain Samuel Vimes 'Boots' theory of socioeconomic unfairness. "Take boots, for example. He earned thirty-eight dollars a month plus allowances. A really good pair of leather boots cost fifty dollars. But an affordable pair of boots, which were sort of OK for a season or two and then leaked like hell when the cardboard gave out, cost about ten dollars. Those were the kind of boots Vimes always bought, and wore until the soles were so thin that he could tell where he was in Ankh-Morpork on a foggy night by the feel of the cobbles. But the thing was that good boots lasted for years and years. A man who could afford fifty dollars had a pair of boots that'd still be keeping his feet dry in ten years' time, while the poor man who could only afford cheap boots would have spent a hundred dollars on boots in the same time and would still have wet feet." The question isn't necessarily can you afford an expensive faucet. It's whether or not you can afford an inexpensive one. What you will learn from this guide is that there does exist a middle ground between super high-end, where you're really only paying for the brand name, and super low-end which is not such a good decision long term. As we said before, this guide is to help you shop for the best value. What is the best Freestanding Tub Filler Faucet you can get for the price? At FaucetList.com we have over 40 years' experience in the plumbing industry. We have seen many companies come and go in this time. We make it a point to carefully curate the items on our site. We choose to offer only the best fixtures that we know will delight and surprise. Take a look at a few of the Free Standing Tub Fillers on our site. These fixtures are guaranteed to be high-quality and look great in your bathroom! "I guess you get what you pay for supply tubes are a bit light weight but serviceable. I bought this to replace a similar faucet that broke after 4 years so hopefully this will last longer. I would have bought a more expensive one if I could but the next price range seems to be a lot more. Anyway here's hoping." So after only four years this customer is yet again replacing their faucet. They even point out that they would have bought the more expensive one if it were possible. Well I guarantee you that if you have to buy a faucet every four years and pay to redo the installation the lifetime cost of ownership will be far higher. And you'll have a worse product! This section of the buying guide really applies to all inexpensive faucets but it is especially relevant when it comes to Freestanding tub Faucets. "caution... junk.... worse product ever purchased. during installation, product fell maybe from a height of 6 inches and broke??? plumber that was hired could not believe quality. purchased far in advance in preparation of our remodel thus encountered issues with refund; incurring 20% restocking fee on a failed product - clearly no warranty. scrambled to get a replacement filler, paying almost twice as much at local plumber retailer. proves you get what you pay for"
It's really hard to install or change a Freestanding Tub Faucet. If you are unsatisfied in any way you will likely not be able to do much about it without major renovations. Installing a Freestanding Tub Faucet is difficult. You really need a professional and a fixture with standard U.S. plumbing connections. 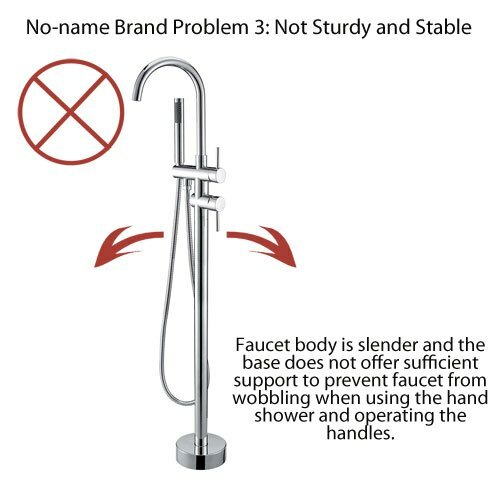 We have read many complaints about installers having problems with no-name brand Faucets because the instructions were either bad or non-existent. "One of our friends had an installer do theirs and the guy completely messed things up. The floor mount bracket was not spaced correctly and when finalized the spigot hits the side of the tub and half the water doesn't even get in the bathtub cleanly." "The only other thing I would say is there are no instructions on how the thing goes together and there are lots of extra parts to get the height right. If you are at all familiar with plumbing it is fairly obvious I'm sure, but took me a while to figure it all out! A diagram would have been helpful." "Little-to-no installation instructions were included and nothing more can be found on the internet. They don't tell you that it ships from an international origination that has specialized fittings. There is so much work to do to install this faucet that we would have been better off paying the extra few hundred dollars and ordering a more expensive one"
It took my plumber a long time to figure out installation. It doesn't come with rough in valve or the square bracket that is needed to bolt to floor(shown in picture of installation but not included). Plumber made his own and bolted to slab. Looks great and works well just difficult install." These quotes were found in online reviews of very inexpensive Floor Mounted Tub Fillers. To be fair, some of these customers were actually happy with the end result, but these quotes help illustrate that ease of installation is not necessary something you should take lightly. Even if it's not you doing the work, a plumber's time is money. Why not save the extra money you spent on installation and get a better Faucet?! If it's hard to install when the walls and floors and everything in the bathroom is ripped open, it's guaranteed to be even harder to make a change to your Floor Mounted Tub Faucet after everything is closed up. The nature of how these fixtures install makes it very problematic to change them after the fact. They are connected to the hot and cold water lines and are bolted to the floor. Special preparations must be made to cut an opening for the water supplies and after installation the valve is usually tiled over. Making changes to the position or the faucet will likely mean ripping up the entire floor. For modifying the installation of a Floor Mount Freestanding Tub Faucet you absolutely need a professional. So if you go with an inexpensive faucet and want to change it later, think again. You might be able to get away with that line of thinking when it comes to a bathroom sink faucet but not with regards to a Freestanding Tub Faucet. We read complaints over and over again that less expensive Freestanding Tub Faucets had poor water flow. The reason for this is that some less expensive items do not use a rough-in valve. In theory that makes it easier to install but this is less sturdy and the flow rate is not nearly as good. 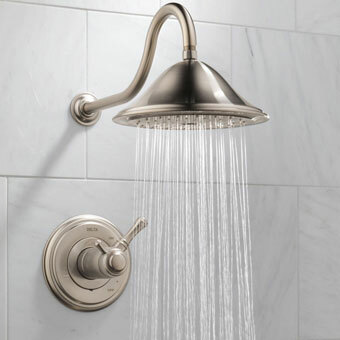 Not all imported fixtures have standard U.S. plumbing connections. They often are smaller and require adapters to fit the plumbing lines in your home. This can significantly impact the flow rate and water output. When you have a large tub it takes some time to fill it up. For example, a large clawfoot tub holds between 40-60 gallons of water. Not only is it boring to wait for the tub to fill up with water, but as more time passes the water starts to cool off. If your inexpensive Freestanding Tub Filler has output of 5 gallons per minute it would take 12 minutes to completely fill the tub. Up the flow rate to 12 gallons per minute and it takes just 5 minutes to fill the tub completely. Put that extra time to good use soaking in the tub rather than waiting for it to fill up. At FaucetList.com we really feel this is the most significant problem with less expensive products. Whether you are shopping for single post style Freestanding Tub Faucets or double supply line Freestanding Clawfoot Tub Faucets you really need to consider the stability of the fixture. I mean, it's in the name. Free Standing. This means these fixtures do not have extra support (although sometimes it can be added). Adding wall supports limits you as to where you can actually place your Floor Mounted Tub Filler. The beauty of this style is that it can go in the middle of the room. If you need to install it near a wall then you lose some of the benefit. You also lose some of the design impact. A truly Freestanding Tub Filler Faucet should be stable and sturdy. It should feel solid when you grab it and it should never wobble or sway. Read these complaints about what buyers of cheap Free Standing Tub Faucets had to say. "If I had to purchase again, I would spend the extra money and get a better tub filler. This filler isn't very heavy and is wobbly since installed. Not sure if that's the fault of my contractor or if it's because it was not an expensive filler. I like how it looks and it works well but disappointed in the quality. I would DEFINATELY spend the X tra money next time but overall we are satisfied w the water pressure and look now that it's installed. Not worth removing and sending back at this point." "Had several problems with this product first the post is not secure at the bottom and wobbles because the fittings are glued inside, the plumber tightens the fitting and the glue breaks loose. Tried to return it and the manufacturer was extremely prompt in getting me a replacement, however the replacement has the same problem." Stability is not just a safety issue. It also is a usability issue. If you have to worry about your Free Standing tub faucet wobbling and rattling all the time it's not going to be as enjoyable to use. Especially for Free Standing Claw Foot Tub Faucets with Hand Shower you will find that removing the Hand Spray from its cradle will sway the faucet. Pulling on the hose will sway it more. This significantly alters your experience from relaxing and soothing to nervous and worried. You really want your Freestanding Tub Fixture to be sturdy and stable. One issue that can be caused by a faulty diverter is that the hand spray will run at the same time as the Tub Filler. We came across this surprising complaint when reading reviews of several less expensive Free Standing Tub Faucets. People reported that some fixtures did not have the ability to operate the hand shower separately from the tub spout. This is absolutely a design flaw and it is not the way your fixture should operate. "I would love it if it worked. The handheld faucet and the faucet both run whenever the water is on, whether the hand held faucet is turned on or not. They already sent us a replacement part once, and after about a dozed uses, it did it again. Maybe the whole faucet is defective, but I'm really stuck now with this style, as I bought the matching bathroom faucets too. I'm hoping for a fix that works this time." 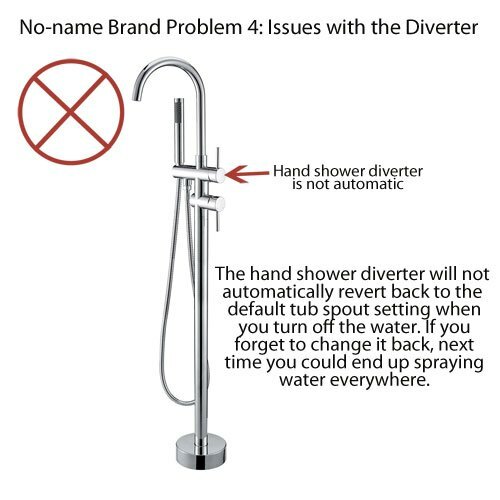 Yet another issue that came up with regards to the hand shower is with regards to the position the diverter remains in by default. 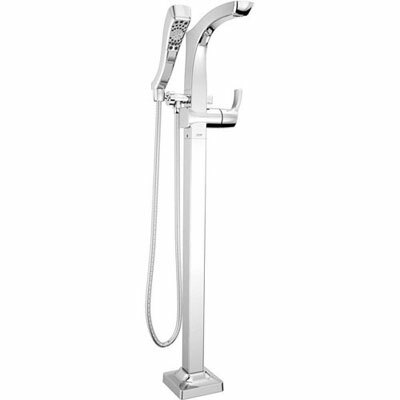 When you have a Free Standing Bathtub Faucet with Hand Spray there will be a diverter to switch the water between the tub spout and the handheld shower. In all nicer faucets the diverter will default back to tub spout when you shut the water off. That way when you turn it on next time the water will flow first from the tub spout which is always aimed at your tub. If the diverter does not automatically switch back it could be a problem every time you want to use the your tub. "The only downside that I've noticed so far is that you have to be careful when turning on the water that the diverter is in the correct position. It doesn't go back to the main faucet after you turn it off. That means you can spray water all over your bathroom if the hand shower was the last thing you used after your bath, and you didn't remember to turn the water back to the faucet (voice of experience :) )." Plumbing codes: We read several complaints from people who bought inexpensive Freestanding Tub Fillers that stated they failed inspection. Specifically in Massachusetts, New York, and California where there are stricter regulations you should be careful about ordering a faucet you are not sure will pass inspection. By the time you install your Floor Mount Tub Faucet and have the inspector take a look it will likely be too late to return. Make sure to check that the faucet will meet local plumbing code before ordering. Warranty and Parts: When you order an inexpensive Floor Mounted Tub Filler from a No-name brand you can basically expect no warranty or parts replacement. Some make an effort to include a 1 or 3 year warranty but this is not nearly long enough. Most problems will not arise until year 8 or after. By the time you actually need help the company may no longer exist and getting replacement parts or help trouble shooting a problem will be next to impossible. You could argue that if you buy a cheap Tub Filler than you can afford to get a new one if a problem occurs. This may well be true but it doesn't factor in the installation costs. We recommend you find a more expensive product that offers warranty support for a minimum of 10 years. A lifetime warranty is better. If you ordered your Freestanding Tub Filler Faucet from Delta you would not only get a lifetime warranty on the product operation, but also on the finish! This is basically unheard of even among the other well-known plumbing brands. Delta has a tech support number that can help you troubleshoot any problems that arise and send replacement parts out for free. You'll never get this piece of mind from a No-name brand. Now that you understand some of the problems that come with ordering an inexpensive Free Standing Tub Faucet it starts to become clear that you probably need to shop for something a little better. So what's the answer? 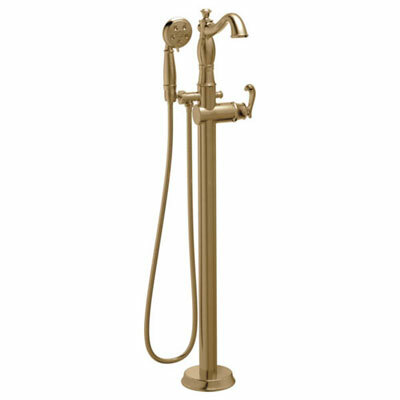 Do you have to spend $3000-4000 on a Rohl, Water Decor, or Aqua Brass Free Standing Tub Faucet to get something that will work well? Our opinion is no. For the brands like these you are really just paying for the name. You are no longer paying for product quality improvements. At FaucetList.com it is our official recommendation that the best Free Standing Tub Faucets are made by Delta. Over the past 60 years Delta has proven time and time again to be an innovator in the plumbing industry. Their fixtures are top quality and their product design is second to none. In our 40+ years in the plumbing industry we have worked with and reviewed hundreds of different Freestanding Tub Filler brands. Where style, quality, finish, ease of installation, warranty, and design function all converge is Delta. As authorized Delta e-tailers we may seem biased but in fact we do not recommend Delta only because we are Delta e-tailers. We became Delta e-tailers BECAUSE we like the Delta products and were confident that our customers would be happy with them. "Love this faucet. We shopped and were stunned at the prices for floor mounted faucets. We found Delta to be affordable with excellent quality. Looks and works great! "This is very well made faucet. It has a sprayer which comes very handy for a quick rinse. I love it!!!" So Let's talk about some of the ways Delta Free Standing Tub Faucets solve the problems posed by no-name brand cheap fixtures. "I had a plumber route the supply lines to the mounting plate. It was very straight forward to install. Note that it must be done prior to installing any flooring - the floor sheathing installs over it. After I completed the floor, installing the faucet was very easy. The supplied instructions were complete and easy to follow." "We are normally stick to Kohler products, however, this unit was much simpler to install than the Kohler equivalent. Worked great for the Delta floor mounted tub filler." "Our plumber installed this pretty easily in our home that is under construction. Did not report any issues." "Follow the directions, which are fairly well written, and the install will go smoothly. Well built; solid construction. Has been installed and working like a charm for 2 months. Wife is happy and so am I with no leaks reported!" So you can see that the installation of a Delta Free Standing Tub Faucet is fairly straight forward. Changing out the faucet however presents similar problems to the no-name brands. You still have to tear up the floor if you want to access the valve. But with a Delta Faucet we are confident you will have no reason to be dissatisfied or want to change your Tub Filler once it has been installed. If you ever have any problems you can rest assured Delta's customer service and lifetime warranty will help you solve them. Here's a great video that provides instructions for How to Install a Free Standing Tub Filler Faucet. This video is Delta specific but it will give you a good idea about what is involved with the installation. Because the Bathtub Faucet is Floor Mounted you must find a way to securely attach it. You also much allow for an opening so the supply lines can connect up to the hot and cold water lines. The Delta Free Standing Tub Valve system is brilliant in its simplicity. Take a look! These instructions provide detailed information about the installation shown in the video. There is also a section detailing how to install a Free Standing Tub Faucet on a concrete floor. Concrete floor installation of a Floor Mount Tub Filler is slightly different but the Delta rough-in valve can handle it without much trouble. Delta's Free Standing Floor Mount Tub Filler has a strong water flow which allows you to quickly fill your tub. Basically any major brand will meet this requirement. I mean it's a tub faucet. It should fill the tub fast. Here are some customers who have had a good experience with Delta Freestanding Bathtub Faucets. "Faucet works great & fills soaker tub rather quickly." "Seriously, it looks expensive and yes, it was expensive but at least the quality and style is apparent. The faucet allows strong water flow and the handheld spray can hit a target across the bathroom"
Delta Faucet Solution 3: Very Sturdy and Stable. In this area a Delta Freestanding Tub Faucet is hands down one of the best. If you watched the how to install a Floor Mounted Faucet video above you will have noticed that the Delta installation is no joke. You literally screw the plate into a wooden platform which is screwed into your floor. That valve is not going anywhere. Once you attach the faucet trim kit you will see just how solid and stable it is. Basically no amount of pulling will make it wobble. The sturdy, heavy-duty build of Delta Free Standing Tub Fillers is definitely one of their selling points. Many customers agree! "This is solidly built and handsome, but we were surprised at how big it is. We are mounting it next to a very large tub so I think it will look good, but we expected it to be smaller." "This freestanding bathtub faucet has real "wow" appeal. My plumber liked it because it was easy to install. I love it because of the quality, the hand held sprayer to wash down the tub or your hair and this faucet was way less expensive than comparable faucets." "This is amazing. It's super heavy duty and sleek." "A bit expensive but the quality is right there with the price. It is awesome and looks great with my tub"
Delta is a high quality product with no issues in the way the diverter functions. In a Delta Free Standing Clawfoot Tub Faucet you will find the diverter functions just as you would expect. By default, when you turn on the water it will come out of the tub spout. Only when you pull out the diverter button does the Hand Shower activate. To switch back to the tub spout, you simply push the diverter button back in. If you are using the hand shower spray and then shut off the water, the diverter button will automatically pop in to reset itself. Because of this feature when you turn on the water it will always initially flow from the tub spout - even if the last diverter setting you used was for the hand shower. All of this is very standard functionality for any high-quality Free standing Tub Filler Faucet. It's rather shocking that any fixture would work any other way. However, with cheaper Tub Fillers the engineering design put into the diverter may just not match up. Delta Faucet Solution 5: Other miscellaneous issues to consider. Plumbing codes: Delta faucet products will meet all plumbing code requirements. Delta faucets are all certified for use in USA. Leaks: Delta Free Standing Tub Fillers have a state of the art ceramic cartridge designed to prevent leaks. However, should a leak ever occur it's good to know that replacement parts are available. You will never be left with the choice of whether to live with a leak or replace the entire faucet. You will be able to get a part to fix the issue. Warranty and Parts: Delta Floor Mount Tub Faucets include a lifetime warranty on both operation and finish. With regards to operation, this means if you ever need a part, you simply call Delta and they will send it at no charge. You can't beat that service! Because Delta is such a large company there is unlikely to ever be a shortage of parts. With regards to finish, this is where Delta really shines. Even the ultra-expensive brands do not usually offer a warranty on the finish. Because of Delta's innovative manufacturing techniques they offer a lifetime warranty on the finish as well as the operation. If your finish ever rusts or discolors you will be able to get a replacement. How cool is that?! This is definitely not the kind of warranty or service you will get from a no-name brand. Having that piece of mind is definitely worth something. 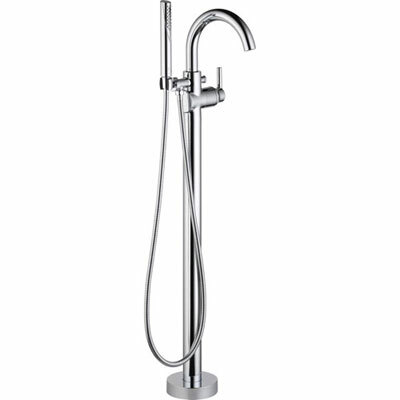 When shopping for a Delta Free Standing Tub Filler you will find some (but not all!) feature a 360 degree swivel spout. Some people prefer the swivel spout as they can rotate it out of the way when they get into the tub. Other people like a rigid spout that doesn't swivel. Consider this feature when you are shopping and order one that fits your requirements. The single handle operation of a Freestanding Delta Tub Filler allows you to easily turn on and set the water temperature. The cartridge provides pressure balancing functionality. This means you will not experience temperature or pressure changes while using the faucet. This feature is especially useful while taking advantage of the Hand Shower spray. If someone flushes the toilet in another bathroom in the house you will not get a burst of cold water. The pressure balancing cartridge will keep the temperature within a steady 3.6-degree Fahrenheit range. The Rotational Limit Stop is an anti-scald feature that manually prevents the handle from rotating to the point where you might accidentally set the water to a temperature that would be unsafe. Depending on factors such as the ground water temperature and the setting on your hot water heater you may find you need to adjust the temperature when you first install your faucet. Several people online mentioned that the water was coming out of their Delta Free Standing Tub Faucet was not hot enough. If this happens to you, it's very easy to trouble shoot. You simply have to reset the Freestanding Tub Filler temperature Rotational Limit Stop. Delta Freestanding Tub Fillers come from the factory with the temperature Rotational Limit Stop preset rather low to ensure that no one gets scalded. Making adjustments to the limit stop is easy. On the handle of your Tub Faucet you will find a small hole. Use an Allen wrench to loosen the set screw in the hole. Take off the handle and you will find a circular part. This is the Rotational Limit Stop. To adjust the temperature of the water coming out of the valve, pull the white Rotational Limit Stop (1) outward and rotate. Clockwise rotation will decrease the outlet temperature, counter-clockwise rotation will increase the outlet temperature. Temperature change per tooth (notch) could be 4-degrees to 16-degrees Fahrenheit based on inlet water conditions. Repeat as necessary. When finished, make sure that the Rotational Limit Stop is fully retracted into the seated position. For full instructions see how to adjust a Delta Freestanding Tub Filler rotational limit stop. Open the link and search for "Adjusting the Rotational Limit Stop"
No matter what Free Standing Bathtub Filler you choose there are a few things you have to think about. A lot of preparation must be done before you start the installation of a Freestanding Tub Faucet. Even with the relatively easy installation offered by a Delta fixture you still have to consider where exactly you plan to put your tub and where you want the faucet to go well before you start work. Remember it's not easy to move it later so make sure to follow the old adage, measure twice and cut once. Make sure you know the exact dimensions of your freestanding tub. You want to be sure that the spout of the Floor Mount Faucet you order will be high enough to go over the Bathtub rim. You should also take into consideration the thickness of the tub rim when you decide how far away from the tub you want to place your faucet. It's best to have the tub spout hang over into the tub at least a few inches. This ensures all the water will end where it's supposed to! Make sure to double check everything before the workers do something that cannot be undone. We read several stories about installations that took a wrong turn. We read about spouts that didn't quite reach into the tub, spouts that weren't high enough to get over the tub rim, and faucets placed in such a way as to make it difficult to get in and out of the tub. Consult your contractor or architect for optimal placement. What type of tub do you have? 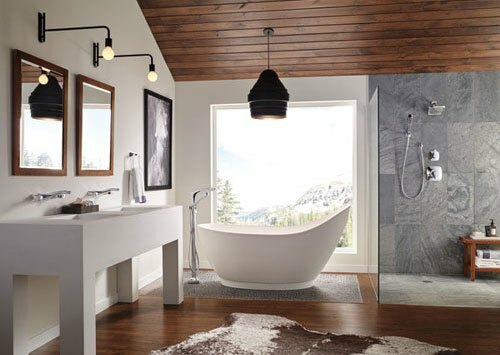 Do you have a Modern Freestanding Tub with sleek lines or a traditional Clawfoot Tub with classic vintage style? For a Modern Bathtub you can look for a stylish and angular Modern Free Standing Clawfoot Tub Faucet. If you have something more old world, consider a Traditional style Freestanding Tub Filler. In most installations you will benefit greatly by choosing a Floor Mount Tub Filler with Hand Spray. A Hand Shower is a great addition to any tub. It makes washing your hair easy. It allows you to wash dogs and small children with ease. Even if you like the traditional style of Freestanding Tub Filler this contemporary upgrade is a nice feature. A traditional look with modern conveniences! Or go all angular square and modern. Create a minimalist clean Zen environment with a modern floor mounted tub filler. The possibilities are endless. The only thing that's for sure is you will be spending a lot more time in your bathroom once your project is done! In additional to the style of the design you should take a moment to think about the finish. Do you want a classic Chrome? A modern Stainless Steel finish? A contemporary and super popular Venetian Bronze? 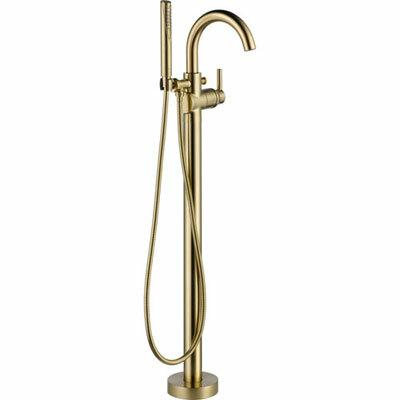 Or maybe you could even the panache offered by the honey gold of a luxurious Champagne Bronze finish. Coordinate your Free Standing Tub Faucet with your other bathroom faucets and accessories. Use the finish of your fixtures to make a good design an amazing design! Make sure you get the Rough in Valve! 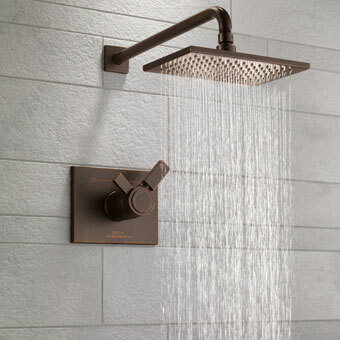 Most manufacturers sell their tub and shower fixtures as two separate components. You have the trim kit, which is the part you see, and the valve, which is the part that installs in the deck, floor, or wall (depending on the fixture). Believe it or not there are actually reasons for this. The best of which being, if you already have the valve, you can simply and easily swap out the trim. So let's say you have a Chrome Freestanding Tub Faucet and want to swap it out for a Stainless Steel Free Standing Tub Filler. Well as long as you stick with the same manufacturer you won't have to change out the valve. Swapping out trim kits is a cool way to update your bathroom design. Since not everyone needs the valve, the manufacturers have decided to offer these items for sale in two parts. Trim kit and Rough in valve. "This is a gorgeous faucet, it swivels from side to side and is perfect for a modern bathroom. I thought it was a great deal until I received it and discovered I had to buy an extra $200 plate to mount it - that made it an average deal." Well I sympathize with this customer's frustration. Feeling mislead on the total price of the product is something that we never want our customer's to feel. If the product costs $200 more than you thought, you should know that up front. Then you can decide if it's worth it. Finding out later that an expensive required part is sold separately will leave a bad taste in your mouth no matter how nice the Freestanding Tub Filler turns out to be. At FaucetList.com we offer many complete Freestanding Tub Faucets that include the valve, trim kit, and handle. Oh yes, the handle is also sometimes sold separately and they are also not cheap. So when you shop with us, look for Freestanding Tub Filler Faucets that are indicated as sold "Complete: Rough-in Valve INCLUDED". You'll see the total price upfront which allows you to decide whether or not the item will fit your budget. You'll also benefit from our expertise. We have taken out the guess work of what valve fits what trim. And what handle works with what faucet. This can be a real headache as nothing is truly universal. You can almost never mix and match a valve and trim made by different manufacturers. Even within the same manufacturer it's still a little tricky to make sure you get compatible parts. Our goal at FaucetList.com is to make buying a Freestanding Tub Faucet easy! Order from us and get what you need to move forward with your job. Don't find yourself in the situation where the plumber is there (getting paid) and you don't have everything he needs. Don't put yourself in the position where you messed up and didn't order a required part and now the contractor is pressuring you to just buy something ugly from a big box store. Join the FaucetList family and order from us! Free Standing Tub Filler Faucets are very popular these days. 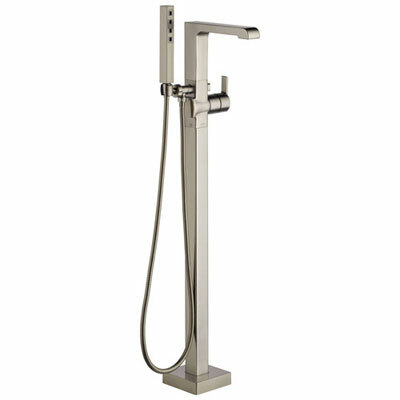 A Freestanding Tub Filler will be sure to make your bathroom the envy of all your guests. With this amazing style comes a few installation challenges. Make sure you carefully consider the fixture you choose to order. Make sure you carefully measure everything so you know the faucet and your tub will be compatible. 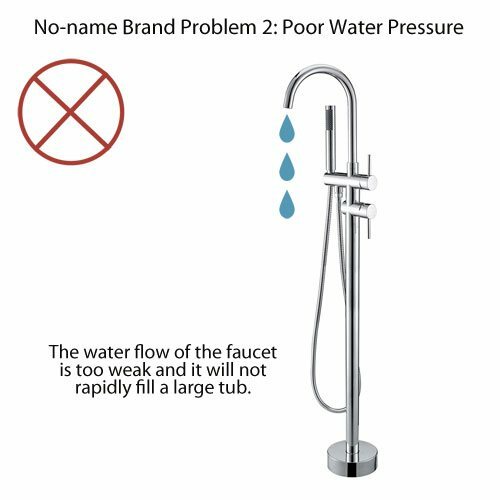 When shopping for a Floor Mount Freestanding Faucet you should really think twice about ordering an inexpensive no-name brand product. For a bathroom sink faucet you can get away with going cheap, but when it comes to a Freestanding Tub Faucet the potential issues far outweigh the cost savings. In fact, over the life of the product it will end up being more expensive to go with one of these super cheap Freestanding Tub Fillers you'll come across for sale online. 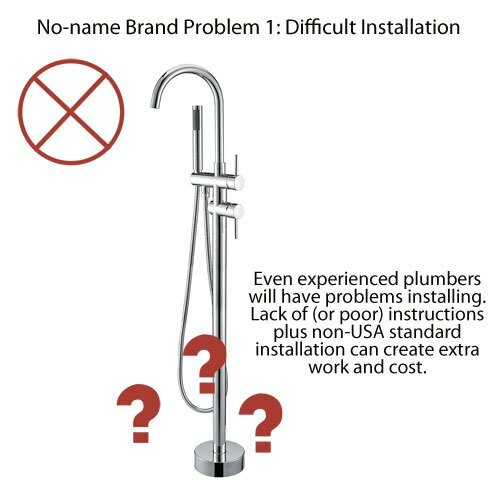 No-name brands are difficult to install, have poor water pressure, can be unstable and wobbly, have issues with diverter functionality, and potentially do not meet US plumbing codes. You won't get a sufficient warranty (if you get one at all), parts replacement will be an issue, and it just plain won't be nearly as nice to use. We could go on and on about why you should not be tempted by the low low price. Is your only option to go with something that costs $3000-4000 then? Definitely not. It is our opinion that Delta Free Standing Tub Faucets are the happy medium. Delta Floor Mount Bathtub Faucets have all the same quality-related features offered by the super-expensive brands but cost significantly less. You'll get designer styling, professional quality, an enjoyable-to-use fixture, and an amazing lifetime warranty that even covers the finish! Join others who have discovered Delta Freestanding Tub Fillers and order yours today! At FaucetList.com we make shopping easy. Shop for a Freestanding Tub Filler Faucet complete with rough-in valve and handle. See the total price upfront and order with just a few clicks! We offer fast and free delivery, easy returns, great customer service, and guaranteed genuine products. Order today and join thousands of happy FaucetList customers! If you have any questions, leave them in the comments section below or feel free to Contact us! installation. Threaded studs can be adjusted up and down for height. I know this doesn’t quite answer your question regarding what holds the valve in place before you pour the concrete. For further help, I recommend you give Delta technical support a call at 1-800-345-DELTA (3358). Delta will be better able to assist you with any installation related questions as their reps are trained on the specifics of their freestanding rough-in valve. I don’t want to give you incorrect information and since I am not a plumber and have not personally done an installation job like this on a concrete slab so I think it would be a good idea for you to call and ask Delta directly. I plan on purchasing a delta free standing tub filler in the next few days.. I’m a contractor and have installed on conventional (wood) foundation in the past.. I’m sure it explains in the instructions, but this will be the first time I install rough in valve in slab.. Was curious to what holds valve in place before you pour concrete to secure.. Any info or heads up would much appreciated..
Is there a mounting bracket system on a concrete floor for a Delta free standing tub faucet?